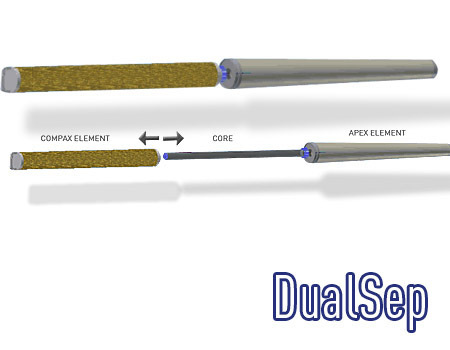 Two efficient filter elements joined together on one core make up DualSep™. Compax®, a proven industry leader in particulate filtration with more surface area than its competitors and APEX®, the tapered coalescing element which keeps annular velocities constant across the entire height of the element. The annular space on the outside of APEX® gradually increases from the bottom to top of the element, keeping pace with the external gas flow as it exited the element. 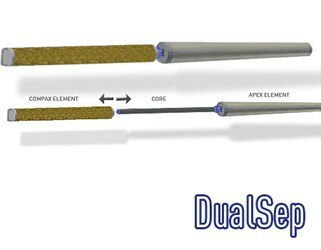 DualSep offers an efficiency and convenience that no other conventional filter element offers; you can change out the particle filter (COMPAX®) up to 4 times before having to replace the APEX® element. This lowers capital and operational costs by saving time and money on top of having more efficient filtration. Conventional elements require a complete change out of both elements, every time! The two elements are connected on the core by a custom Viton® lip seal which seals at the base of the core.